The following is a third in the 2nd series that is focused on the topic of the impact of genomics and transcriptomics in the evolution of 21st century of medicine, We have already visited the transcription process, by which an RNA sequence is read. This is essential for protein synthesis through the ordering of the amino acids in the primary structure. However, there are microRNAs and noncoding RNAs, and there are transcription factors. The transcription factors bind to chromatin, and the RNAs also have some role in regulating the transcription process. We shall examine this further. Exploring the Roles of Enhancer RNAs Scientists have recently discovered that enhancers are often transcribed into RNAs. But they’re still not sure what, if anything, these eRNAs do. can upregulate genes from some distance. over-represented in enhancers and promoters relative to exons. from genes near the enhancers. enhancer RNAs are transcribed from both DNA strands, producing what are called bidirectional transcripts. 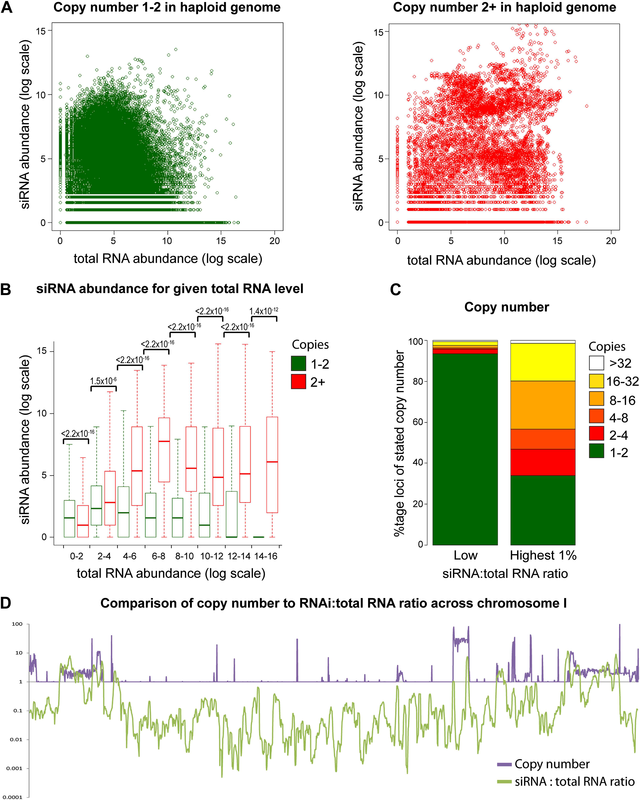 eRNA production correlates with the production of mRNA from the genes that enhancers regulate. this interaction creates a loop of DNA between the two genetic elements. the act of transcription trumps the importance of the transcripts themselves. reduced the ability of enhancers to upregulate gene expression. reduced looping between enhancers and promoters. and for the interaction between the enhancer and the cognate regulated promoter,” said Rosenfeld. luciferase expression was upregulated about 2.5-fold. in the regulation of livin gene expression in two breast cancer cell lines (4Ti and MCF-7). led to the down regulation of livin expression. since transcripts from multi-copy loci form double stranded RNA more efficiently than transcripts from equivalently expressed single-copy loci. transposable elements amplifying within the genome. http://dx.doi.org:/10.7554/eLife.01581.001 Over the past decade, our understanding of the complexity of the eukaryotic transcriptome has been revolutionized. Genome-wide sequencing studies in many organisms have revealed that protein-coding mRNAs are augmented by a multitude of non-protein coding RNAs (ncRNAs), many produced from regions of the genome traditionally considered to be transcriptionally silent (Brummelkamp et al., 2002; Bertone et al., 2004; Cheng et al., 2005; David et al., 2006; Birney et al., 2007). Functional data for the vast majority of ncRNAs are currently lacking, with only a few examples characterized in any detail; however, the diversity of mechanisms by which these act suggests that ncRNAs have a rich and varied biology that is largely still to be sampled. Long ncRNAs which overlap protein-coding genes have the potential to modulate the expression of their cognate coding RNA. Early characterized examples in yeast were thought to work by directly disrupting transcription factor or polymerase binding to the promoter of the coding RNA (Martens et al., 2004; Hongay et al., 2006); however, more recent data implicate specific chromatin structure changes in repression (Gelfand et al., 2011; Hainer et al., 2011), and many other cases of ncRNAs that alter chromatin modifications have been described (Camblong et al., 2007; Berretta et al., 2008; Houseley et al., 2008; Pinskaya et al., 2009; van Werven et al., 2012). Chromatin modifications are not necessarily repressive, and ncRNAs that enhance expression of their overlapping coding gene have also been described (Uhler et al., 2007; Hirota et al., 2008). 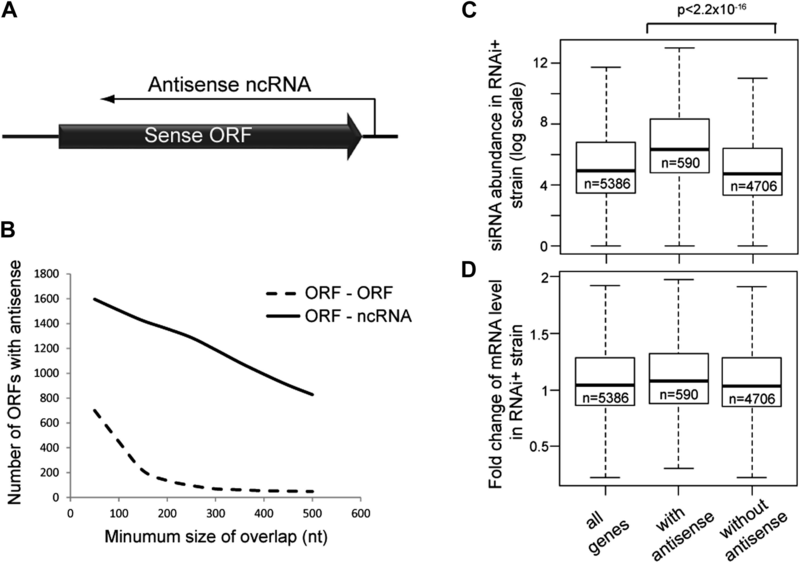 Multi-copy loci are preferentially targeted by RNA interference (RNAi). with matching sequences, before translation begins. and many of these are capable of starting the process of RNA interference. it is related to the number of copies of the gene encoding such RNAs in the genome. genetically engineered yeast cells containing Dicer and Argonaute. the expression of some genes with high ‘copy numbers’ was reduced. particularly if the copies of the genes were clustered in one location in the genome. new functions are steadily emerging. Transcription activator-like effectors (TALEs). Naturally found in some bacteria, TALEs are proteins that bind DNA through repeat domains, and their code for sequence specificity has been elucidated allowing sequence specific TALEs to be engineered. A family of sequence-specific RNA-binding proteins, which bind 3ʹ untranslated regions within mRNAs to repress target mRNA translation. Dysfunctional relatives of normal genes thought to arise from duplication or retrotransposition. Noncoding RNAs serve a wide range of functions in cellular and developmental processes and are therefore likely involved in the development and pathophysiology of many diseases. Thanks to the effective inhibition of micro RNAs in vivo, scientists have already made groundbreaking discoveries about the contribution of short regulating RNAs in human diseases in areas such as cancer, heart disease, and diabetes. Dr. David Corey from the Department of Pharmacology at the University of Texas Southwestern Medical Campus in Dallas, Texas; Dr. Stefanie Dimmeler from the Institute of Cardiovascular Regeneration at Goethe‐University in Frankfurt, Germany; Dr. Jan‐Wilhelm Kornfeld from the Department of Mouse Genetics and Metabolism, University of Cologne in Germany. Dr. Corey’s group is interested in antigene oligonucleotides, antisense oligonucleotides, nucleic acids, RNAi, and telomerase. I have two goals for my presentation today. give a brief introduction to the concept of using nucleic acids as dugs. a search for new methods to develop drugs includes nucleic acids that can bind to RNA and affect gene expression. The advantages of this approach are that one can identify an active oligomer, a lead compound very quickly in weeks rather than years. use single cell stranded oligonucleotides to bind directly to an RNA target and block their action. helps it to find a messenger RNA target and efficiently inhibit gene expression. What kind of cellular RNAs can be targeted by nucleic acids? they could be the RNA domains of ribonucleoproteins and the classic example of that is telomerase. One could also target messenger RNA. You could block translation or you could affect splicing so for example upregulate an isoform that might be useful in treating a disease. blocking the microRNA you can affect its action. I’m going to discuss targeting long noncoding RNAs, which can be used to either up or down regulate gene transcription. Earlier this year Kynamro, an antisense oligonucleotide that targets Ap‐B1 messenger RNA, was approved by the food and drug administration. This is a systemically administered oligonucleotide that’s been shown to reduce LDL cholesterol. So it’s the strongest proof to date that synthetic oligonucleotides can be made on the scale that’s large enough to be used as drugs and be administered to patients and get through the FDA approval process. 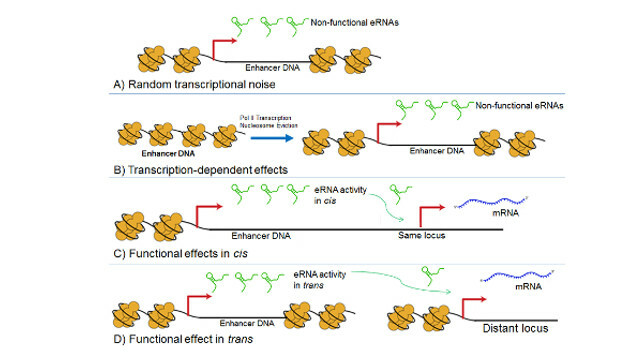 Now I’d like to show you just how the boundaries of regulation can be pushed by using noncoding RNAs to regulate transcription of an operon within the icosanoid signaling pathway. Messenger RNAs are often overlapped by long RNAs at both their 3’ and the 5’ termini as well as within the gene providing a new realm of potential targets for addressing gene expression. These are genes that are known to regulate x chromosome inactivation or transcriptional multigene regulation programs. one might think that with RNA that RNAi factors that are so successful in regulating messenger RNA might be involved. But today they haven’t really been strongly implicated in mammalian cells. we know that microRNAs are in the nucleus. we also know that RNAi factors like argonaute 2 are in the nucleus. we also know that noncoding RNAs are in the nucleus. to form what are essentially ribonucleoprotein complexes that can act to control either gene transcription or gene splicing. The RNA domain protects the RNA and promotes binding to the target. The RNA domain directs specificity to a particular RNA target inside the cell, for example a long noncoding RNA. we now have the noncoding RNA raw material that might allow recognition to control gene expression of COX‐2 messenger RNA. there were a substantial number of microRNAs with complementarity to the COX‐2 promoter. COX‐2 promoter became candidates for regulating COX‐2. promoter. So that resembles how micro‐RNAs recognize typically 3’ untranslated regions. it became our prime candidate for investigating for potential regulation of COX‐2 expression through regulating its transcription by binding a noncoding RNA. When we add these inhibitors into cells COX‐2 expression goes down. This is as far as this reviewer wishes to prodeed in the presentation(s) Explore microRNA as therapeutic targets Efficient [in vivo] silencing using LNA™-enhanced inhibitors exiqon.com/in-vivo-mirna-inhibitors Nature Reprint Collection MicroRNAs from bench to clinic Progress in the microRNA fi eld over the last 12 years has been nothing but remarkable. MicroRNAs were only discovered in humans in 2001, but since then they have revolutionized cell biology and completely changed the way we view the regulation of gene expression. They are now known to be involved, at some level, in all cellular and developmental pathways and all major types of disease, including all cancers, as well as metabolic, cardiovascular, neuronal and immune-related disorders. Exiqon’s LNA™- based microRNA research tools have been instrumental in many of the groundbreaking discoveries in the field. In this collection, we are thrilled to present some of the recent advances in moving microRNAs from basic research into the clinic both as biomarkers and therapeutic targets. Since the discovery of circulating or extracellular microRNAs, their potential as minimally invasive diagnostic and prognostic markers for disease has been actively investigated. Here we feature two articles where qPCR profiling of microRNAs in biofluids have been shown to have diagnostic potential. Another promising area with clinical prospects is microRNA in situ hybridization (ISH) in FFPE samples. We have included an article detailing the prognostic potential of microRNA ISH in this collection. Due to their extensive involvement in human disease, microRNAs are naturally interesting targets for therapeutic intervention. One of the most advanced areas in this respect is the potential of microRNAs as therapeutic targets in cardiovascular disease and we have included a review of this area. In addition, two very recent and groundbreaking studies that have shown the exciting potential for microRNA inhibition in diabetes and epilepsy are also included. Identification of serum microRNA profiles in colon cancer E Hofsli*,1,2,7, W Sjursen3,4,7, W S Prestvik5, J Johansen2, M Rye2, G Tranø6, et al. 1Department of Oncology, St Olavs Hospital, Trondheim University Hospital, 2Faculty of Medicine, Department of Cancer and Molecular Medicine, Norwegian University of Science and Technology, 3Department of Laboratory Medicine Children’s and Women’s Health, Norwegian University of Science and Technology, 4Department of Pathology and Medical Genetics, St Olavs Hospital, Trondheim University Hospital, 5 Faculty of Technology, Sør-Trøndelag University College, and 6Department of Gastrointestinal Surgery, St Olavs Hospital, Trondheim University Hospital, Olav Kyrresgt 17, Trondheim 7006, Norway British Journal of Cancer (2013) 108, 1712–1719 | http://dx.doi.org/10.1038/bjc.2013.121 Background: microRNAs (miRNAs) exist in blood in an apparently stable form. We have explored whether serum miRNAs can be used as non-invasive early biomarkers of colon cancer. Methods: Serum samples from 30 patients with colon cancer stage IV and 10 healthy controls were examined for the expression of 375 cancer-relevant miRNAs. Based on the miRNA profile in this study, 34 selected miRNAs were measured in serum from 40 patients with stage I–II colon cancer and from 10 additional controls. Results: Twenty miRNAs were differentially expressed in serum from stage IV patients compared with controls (Po0.01). Unsupervised clustering revealed four subgroups; one corresponding mostly to the control group and the three others to the patient groups. Of the 34 miRNAs measured in the follow-up study of stage I–II patients, 21 showed concordant expression between stage IV and stage I–II patient. Based on the profiles of these 21 miRNAs, a supervised linear regression analysis (Partial Least Squares Regression) was performed. Using this model we correctly assigned stage I–II colon cancer patients based on miRNA profiles of stage IV patients. Conclusion: Serum miRNA expression profiling may be utilised in early detection of colon cancer. MicroRNAs from bench to clinic Figure 2. Differentially expressed miRNAs in stage IV (red bars) vs stage I–II (blue bars) colon cancer. The expression of 34 miRNAs was compared, and 26 miRNAs were detected. In all, 21 of 26 detected miRNAs showed the same expression profile in early-stage I–II vs metastatic stage IV colon cancer. Figure 3. Prediction analysis of early-stage colon cancer patients. Controls are shown in red and cancer samples in blue. 9 out of 10 healthy controls were correctly predicted as true negatives and 35 out of 40 patients with cancer as true positives. MicroRNA profiling of diagnostic needle aspirates from patients with pancreatic cancer S Ali1, H Saleh2,3, S Sethi2, FH Sarkar1,2 and PA Philip*,1 1Department of Oncology; 2Department of Pathology; 3Karmanos Cancer Institute, Detroit Medical Center, Wayne State University School of Medicine, Detroit, MI BACKGROUND: A major challenge to the development of biomarkers for pancreatic cancer (PC) is the small amount of tissue obtained at the time of diagnosis. Single-gene analyses may not reliably predict biology of PC because of its complex molecular makeup.MicroRNA (miRNA) profiling may provide a more informative molecular interrogation of tumours. The primary objective of this study was to determine the feasibility of performing miRNA arrays and quantitative real-time PCR (qRT– PCR) from archival formalin fixed paraffin-embedded (FFPE) cell blocks obtained from fine-needle aspirates (FNAs) that is the commonest diagnostic procedure for suspected PC. METHODS: MicroRNA expression profiling was performed on FFPE from FNA of suspicious pancreatic masses. Subjects included those who had a pathological diagnosis of pancreatic adenocarcinoma and others with a non-malignant pancreatic histology. Exiqon assay was used to quantify miRNA levels and qRT–PCR was used to validate abnormal expression of selected miRNAs. RESULTS: A total of 29 and 15 subjects had pancreatic adenocarcinoma and no evidence of cancer, respectively. The RNA yields per patient varied from 25 to 100 ng. Profiling demonstrated deregulation of over 228 miRNAs in pancreatic adenocarcinoma of which the top 7 were further validated by qRT–PCR. The expression of let-7c, let-7 f, and miR-200c were significantly reduced in most patients whereas the expression of miR-486-5p and miR-451 were significantly elevated in all pancreas cancer patients. MicroRNAs let-7d and miR-423-5p was either downregulated or upregulated with a significant inter-individual variation in their expression. CONCLUSION: This study demonstrated the feasibility of using archival FFPE cell blocks from FNAs to establish RNA-based molecular signatures unique to pancreatic adenocarcinoma with potential applications in clinical trials for risk stratification, patient selection, and target validation. British Journal of Cancer (2012) 107, 1354–1360. 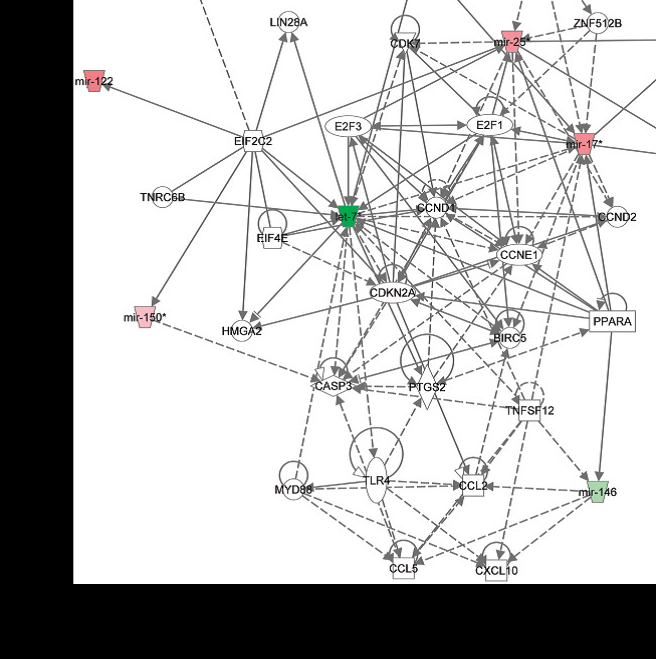 http://dx.doi,org:/10.1038/bjc.2012.383 Comparative expression of seven miRNAs tested in FNA samples Figure 1 Ingenuity network analysis showing up (red) and downregulation (green) of miRNAs analysed by miRNA profiling in PC and their targeted genes. 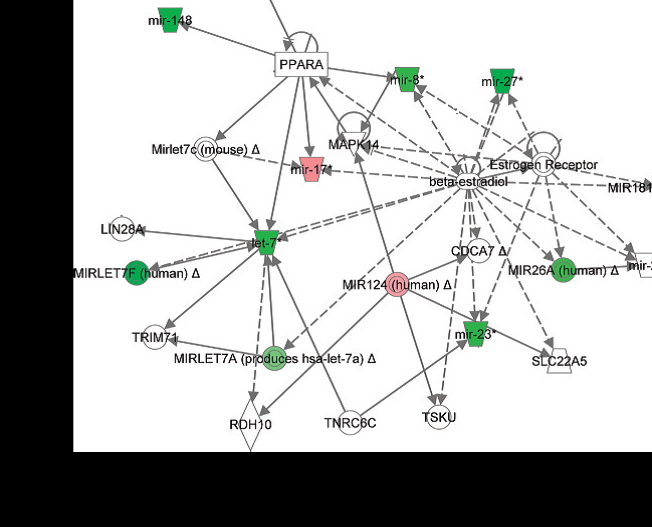 Figure 2 Ingenuity network analysis showing up (red) and downregulation (green) of miRNAs involved in PC and their target genes (A). The solid lines connecting genes represent a direct relation and dotted lines indirect relation. We also observed 15 bio functional network groups that included cancer, genetic disorder, and gastrointestinal disease (B).